The popular Google Wifi System is discounted right now, and it continues to be a best-seller on Amazon and elsewhere. If you decide to pick one up, rest assured that you’re getting a terrific mesh wireless solution. 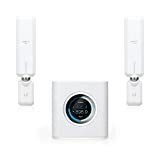 But if you want the best in the business in terms of range, reliability, and sustained data speeds, spend another $30 and get the AmpliFi HD (High-Density) Home Wi-Fi System instead. Trust us, you’ll be happy you did.